I caught up with Pro Surfer and Model Corinne Evans! Read on to find out what she’s been up to over the winter, whats in store for her this summer, her Girls Surf Tour and much more! | Hey Corinne, hows things? Hey Lex! Things are really good thanks! | Have you been getting some Spring swell action down there in Newquay? I’ve been surfing heeps! The waves have been really fun in Cornwall and its finally starting to warm up, I’ve been surfing some different spots which are still right on my door step, which I’ve been loving! | I’ve seen you’ve had some winter sun, fill us in! You’re correct! I’ve just got back from the Canaries. I went on an actual holiday with my partner. We surfed loads, ate lots of delicious food and sampled some local cervezas! It was an absolute dream. | What was the best thing about your trip? The best this is surfing where you want when you want and getting to surf new waves and reefs. | Do you have some more trips in the pipeline for this year? 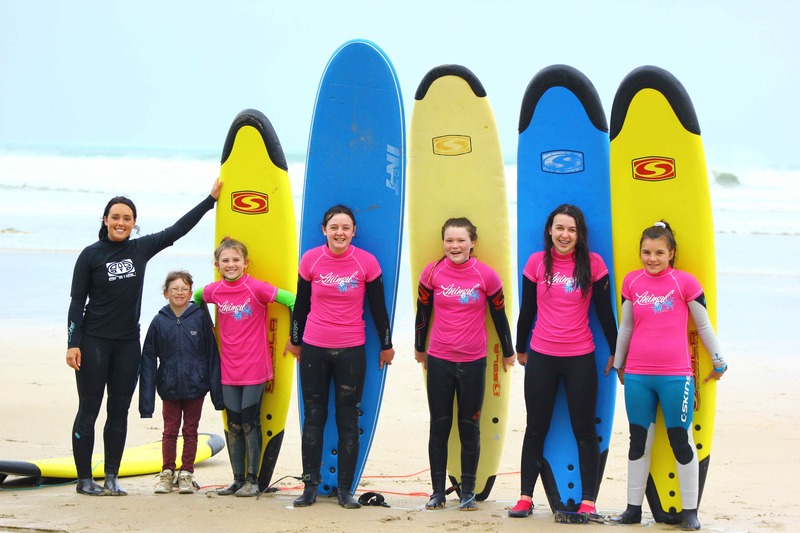 I’m off to France in June/July to host my Girls Surf Camp. I love hanging out with the guys at Feral Surf Camp, glamping and surfing all day. What more could I want. | You’re in your third summer of your Surf Girl Tours and they are going really well! Whats new for this season? Yep I’m in my third year.. where has the time gone! This year I decided to changes things up a little and host ability specific lessons. I’m running Gidget (Beginner) Courses, Margo (Intermediate) Courses and Rell (Advanced) Courses. I just want to ensure I’m offering lessons for all ages and abilties. | Whats the best thing about them? It makes it easier for women when booking in and ensures they get the best possible coaching for their abilities! | What locations have you got lined up this summer? | Where can we find out all the info about your Girls Days? Get yourselves over to www.corinneevans.com for full tour dates and Corinne’s Surf Tour Facebook Page for pics and videos! | So other than surfing you’re a model as well. Living the dream! Which do you prefer, surfing or modelling… or are they pretty much hand in hand? They do pretty much go hand in hand but Surfing is my a real passion and the thing I will do even when I am really really old! | You’re a busy girl, what do you do in your down time? I practice a lot of yoga and pilates and cook a lot of food. My family and friends know me as a feeder. Nothing makes me happier than feeding people food I’ve cooked from scratch. | What boards will you be riding this year? This year I will mostly be riding my epic Doofer and Bettsy. Both boards are shaped my Luke Hart and Fourth Surfboards and are by far the best boards I have ever ridden. He’s shaped boards that have helped me progress a lot this year. | What wetsuits are you loving? I’m currently surfing the next season C-Skins Angel and Wired winter suits which as amazing. So flexible and warm. I am hoping it won’t be long till I’m surfing my C-Skins Rewire, it just needs to warm up a little. | Whats going to be you season staple? My season staples would have to be the Animal Ivella Swimsuit and Animal Napa Sandals. I am loving a swimsuit this season and you can’t go wrong with a pair of gladiator sandals. | Summer tipple of choice? It has to be Elderflower Presse, it’s just so delicious! | What will you be whipping up in the kitchen this summer? What won’t I be whipping up haha! I love cooking and I try and cook anything and everything.